Carrie Mast, a Mennonite from Bluffton, Ohio, recently wrote a post for Bearing Witness about the process of adapting the story of martyr Jacques d’Auchy into a dramatic script with her husband, Gerald Mast, and their children. Her original post prompted a follow-up conversation with her and Gerald on teaching the Martyrs Mirror to children. We don’t usually think of the Martyrs Mirror as being a book for children. What does it have to offer children? Carrie: The Martyrs Mirror is a complex text. There is much more than assured grim death. The accounts of the martyrs detail exquisite examples of faith and love in each and every story. In fact, we operate from the perspective that the Martyrs Mirror is a collection of accounts of people who would prefer to be remembered on the basis of their unfailing faith in Jesus Christ rather than in the grisly deaths imposed on them by the government in the name of the church. So the martyrs offer all of us today incredible examples of faithful followers of Jesus. How have you found the Martyrs Mirror to be useful in teaching children? Carrie: We highlight the lives of the martyrs rather than their deaths when teaching children with the text, but we include their deaths as we retell the accounts as the ultimate act of non-violent responses to one’s enemies. 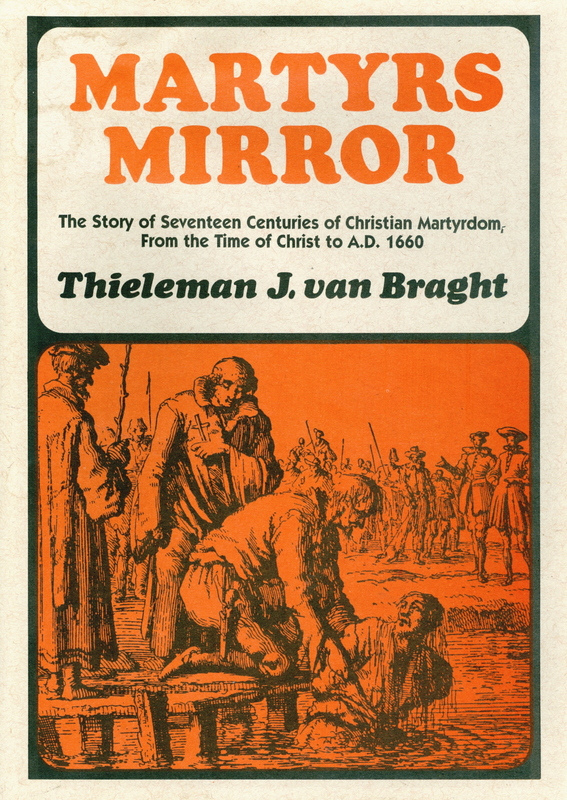 Children and youth (and adults) are consistently surprised by what is in the Martyrs Mirror. During Advent this year, I offered the time for children during a worship service focused on love. I included a copy of the Martyrs Mirror as part of the visuals and used a love letter from the Martyrs Mirror as an example. Gerald selected the love letter from the account of Adriaenken Jans who wrote the letter to her husband while in jail. Adriaenken was an Anabaptist Christian hundreds of years ago. Her story is told in the Martyrs Mirror. She was put in jail because she believed in ways that were different from the government and the big church that almost everyone else went to. For example, she believed that people should be baptized when they were old enough to choose to be baptized instead of when they were little babies. There were other differences, too, about Communion and how to read the Bible. While she was in jail, she wrote a love letter to her husband, and it is in this book. One of the lines in her letter goes something like this…”I, your dearest wife, greet you with the kiss of eternal love with the mouth of my heart.” That’s very romantic and maybe sounds a little icky to you now, but just wait until you are older. Many people think this book is very dark and sad because Adriaenken and many other people were actually killed for the way they believed, but what many people don’t realize is that this book is really about love – GREAT examples of love for husbands and wives, like this love letter, and the love of parents for their children and love for our brothers and sisters in Christ and Love for God and Jesus and even much love for enemies – it is all in this book! The children were engaged during the story, and now they know the text for something beyond gruesome deaths. This is one example of how we teach children with the Martyrs Mirror. You have worked extensively with the story of Jacques d’Auchy from the Martyrs Mirror, writing a script based on the story and even including your children in its creation. What have you found to be the most compelling elements of d’Auchy’s story? What have your children found most memorable? Gerald: We were impressed with the range of emotions expressed in the dialogues: anger, hurt, weariness, humor, sympathy, frustration, fear, compassion, affection, sorrow, and love. Our children seemed most intrigued by the intensity and firmness of conviction expressed in Jacques d’Auchy’s words. There’s something about the simple commitment to the Word of God as he understood it that they found remarkable. Thanks so much to Carrie and Gerald for sharing your insights with us!